Here at the online apologetics and discernment Apprising Ministries, I’ve been following the aftermath of the dubious decision made by Dr. John Piper to have Purpose Driven Pope Rick Warren as the keynote speaker at the recently concluded DG 2010 conference Think: The Life of the Mind & the Love of God. Being a Southern Baptist (for now) pastor, as well as a former Roman Catholic and one of the leading critics of arguably the most visible pastor in the largely pretending to be Protestant Southern Baptist Convention, I’ve shown you many curious associations made by Warren e.g. in Rick Warren, Cindy Trimm, Paula White & The Law Of Attraction, Rick Warren, LaVerne Adams, And Chuck Pierce’s Global Spheres, and Rick Warren And Purpose Driven Roman Catholics. Please read the following words carefully. Afterwards, guess where the author spoke? Really; “five of the world’s leading authorities” concerning the life of our Creator? *cough* Well, for now let’s leave aside Scot McKnight, a theologian well respected within the sinfully ecumenical neo-liberal cult of the Emergent Church aka the Emerging Church, whom Mark Dever says in the 2006 Christianity Today‘s article Nothing But the Blood “finally rejects” Christ’s vicarious aubstitionary penal atonement by saying that the God-breathed words of Mark 10:45 were probably just “Mark’s theologizing. We also, for this piece anyway, ignore the wishy-washy contemplative Philip Yancey and his (at best) Philip Yancey And A Non-Stance On Homosexuality. 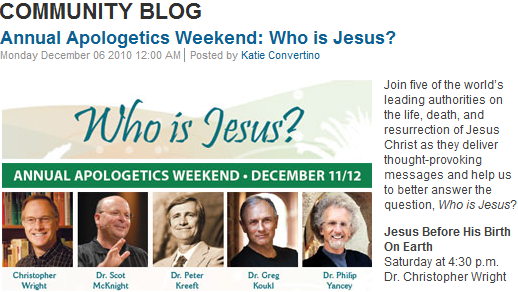 Since Rick Warren is on record as having defiantly declared, “I see absolutely zero reason in separating my fellowship from anybody” I’m going to draw your attention to Peter Kreeft, who is “is a convert to the Catholic Church from reformed Protestantism.” In the real Christian world this means that Kreeft is an apostate; not that someone who has rejected the actual Gospel of God, i.e. salvation is by God’s grace alone, through faith alone, in Christ’s finished work on the Cross alone, for the false gospel of apostate Roman Catholicism would be of concern to the PDL pope Rick Warren. Seriously though, shouldn’t we wonder why Warren seems so enamored with bringing evangelicals back to the Roman Catholic Church? Here’s a news flash: Evangelicalism, right now, is as apostate as the Roman Catholic Church in Luther’s day. Since my time looks to be up, then I will tell you plainly, sadly there seems to be no Luther now.